This month, WildAid's Shawn Heinrichs and Josh Stewart of Manta Trust conducted a research and filming expedition to Peru, working closely with our partner Planeta Océano with support from Disney Worldwide Conservation Fund. Peru and Ecuador waters are home to one of the most significant populations Oceanic mantas in the eastern Pacific. Both Peru and Ecuador are parties to Convention on the Conservation of Migratory Species of Wild Animals (CMS) that now lists both manta and mobula rays for protection. Whereas Ecuador has implemented national regulations protecting mantas and mobulas, just south of their border, Peru has yet to adopt similar protections. WildAid, Manta Trust and Planeta Océano are now working to shore up protection for manta rays in Peru. Working closely with coastal fishing communities, we are seeking to understand how mantas and mobulas are affected by local fisheries, both directed and as bycatch, and how to reduce manta mortality. Building off our community based work in Indonesia, where in 2014 Indonesia declared the world's largest manta sanctuary, we are now helping create opportunities for fishing communities in Peru to engage in sustainable livelihoods based on manta tourism. The project is in its early stages but the initial findings are quite positive. During this expedition, Josh Stewart, a marine biologist, swam down underneath a 15-foot oceanic manta ray to capture a photo ID (every manta has a unique spot pattern on its belly) to be used in our assessment of manta populations and movements. Mantas in Peru have most likely never encountered a diver or snorkeler before, as diving ecotourism in the region is essentially nonexistent. This particular manta ray was clearly surprised to have snorkelers in the water and put on quite a show when Josh approached from beneath to capture the photo ID. However, logging this individual's unique spot pattern was worth the shock — both for the divers and the manta — as photo ID databases allow researchers to monitor population trends. This is especially critical in Peru where the manta population is threatened by both targeted fisheries and accidental entanglement in gill nets. In addition to researching the status of manta rays in Peru and the impact of fisheries, this project aims to introduce manta tourism to the region, which would provide an alternative livelihood to local communities as well as an economic incentive to protecting this vulnerable population. 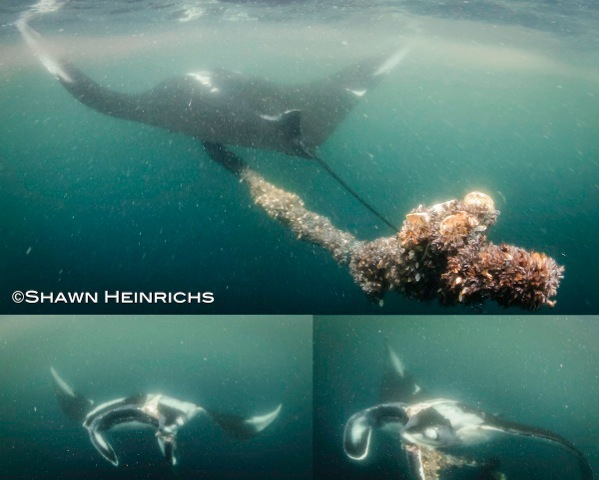 Manta ray populations are under serious threat worldwide from directed fisheries targeting mantas for their gills and meat, and from accidental entanglement in nets and fishing line. Given the significant declines in regional populations, mantas are now listed under Appendix II on the Convention of International Trade in Endangered Species. WildAid has a global campaignto protect manta rays, focusing on demand reduction for manta gills in China and range-state protections where regional manta populations are under threat from fisheries.